btw what is this mysterious Goatlord/Nunslaughter/Funeral Nation/Gravewurm split? It's sort of a tribute to the fallen soldiers from Goatlord (Ace and Joe). It has the very last track they recorded before breaking up in the 90's. Ace added vocals to the song some years ago. Don of the Dead approached the band about doing a split together and it morphed into this four way split EP. I'll do it on 12" format limited to 250 copies. Thanx! Thats great news!!! though i am a bit surprised about limit cause i though there is way more Goatlord and Nunslaughter(yes i know them made too many releases, but last years there was hardly any new studio material) fans. When do we get new grave upheaval on cd? I can’t find information anywhere! It's at the press now. It's one of those fancy hardbound book CDs so it's taking longer than expected. 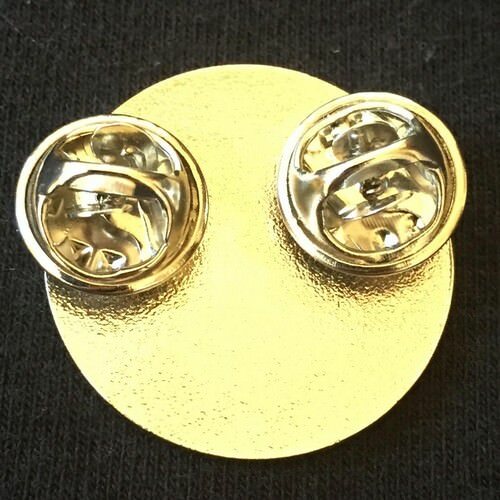 We also went back and forth with various factories to get the best pricing since it's an expensive project. That is fantastic news! I missed the die hard while moving and low on funds so this will definitely help make up for that. 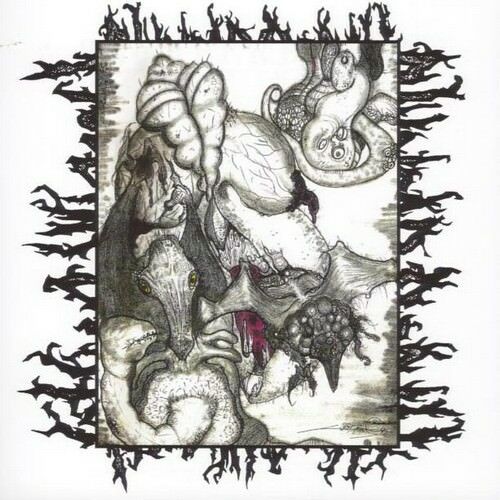 With their two previous albums, Sect Pig established an unorthodox and decidedly unique sound and aesthetic. On“Crooked Backs,” the band’s third album, Sect Pig intensifies their approach. Violent and repetitious, frenzied and hallucinatory. Sect Pig’s sound on this album is disorienting and extreme. Precision guitar attacks and tumultuous percussive abuse characterize the band’s instrumental approach. Sect Pig utilize delay and other effects with intention, augmenting the tracks to add dimension and foster confusion. 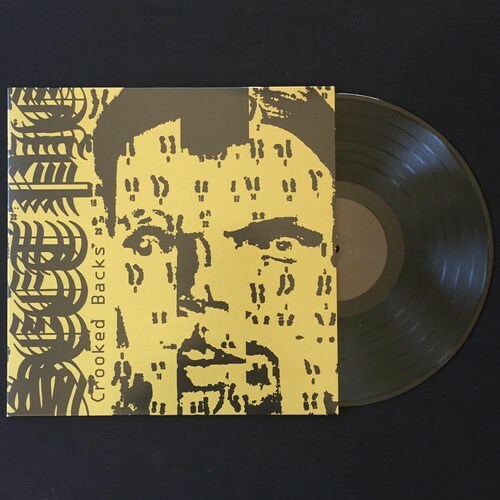 “Crooked Backs” displays a greater degree of compositional nuance than its predecessors, with unanticipated riffs, temporal shifts, and eccentric effects and sounds embedded within the tracks. 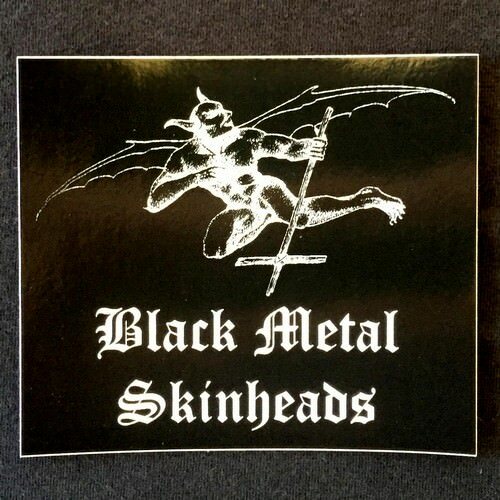 The strange confluence of elements is emphasized as disparate due to the fact that the band consists of a conglomerate of unknown international members whose identities remain shrouded in misguided speculation. 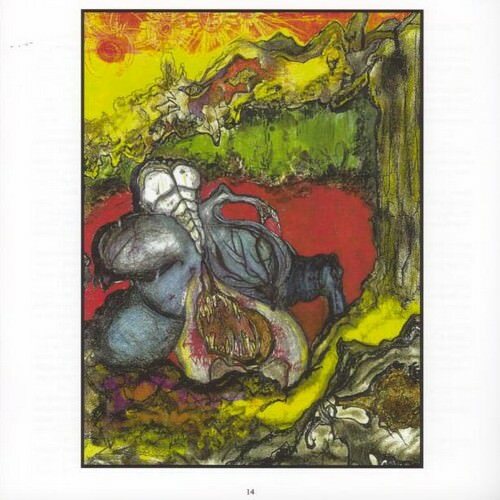 But perhaps the most salient aspect of Sect Pig’s music are the human voices, which assume a prominent role, both in the form of the heinous barrage of vocals and the intermittent use of narrative samples between the songs. The vocals are contorted andwretched; they are barked, snorted, and snarled. Like the previous Sect Pig releases, “Crooked Backs” is thematically tethered to a particular subject, framed by the use of voice samples that shape the psychological experience of the listener. 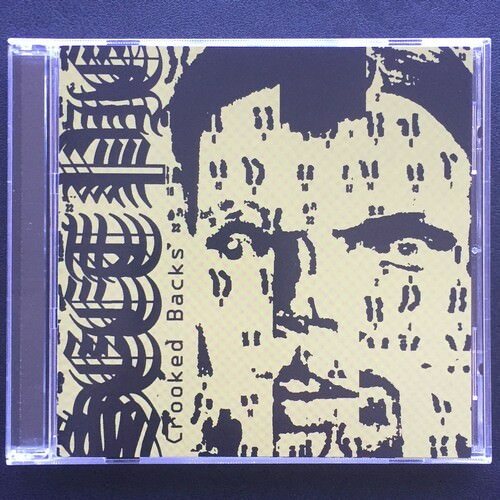 “Crooked Backs” is an anti-meditation on eugenics, on man’s efforts to selectively breed the best human specimens and eradicate the diseased and feeble minded. Whereas genocide has long been universally condemned, more subtle and pernicious ways of modifying the gene pool persisted. 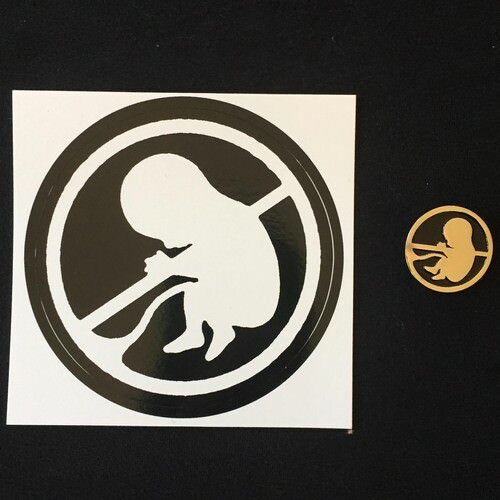 Though many believe that forced sterilization is a practice confined to the distant past, in the United States it occurred until the early 1980s. 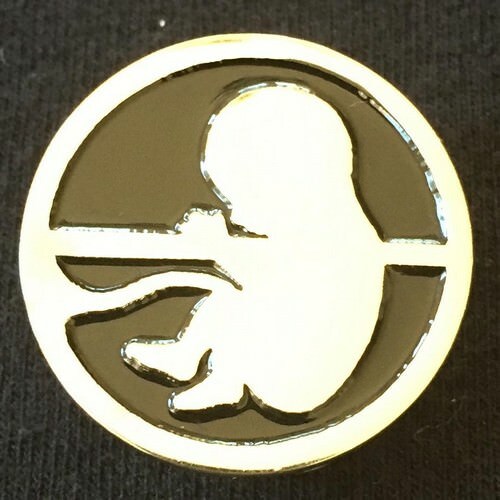 Sterilization was accepted a way of ensuring that individuals whose minds were mentally deficient or criminally inclined, or whose bodies were physically mangled and misshapen, were precluded from corrupting the genetic trajectory of the human race. 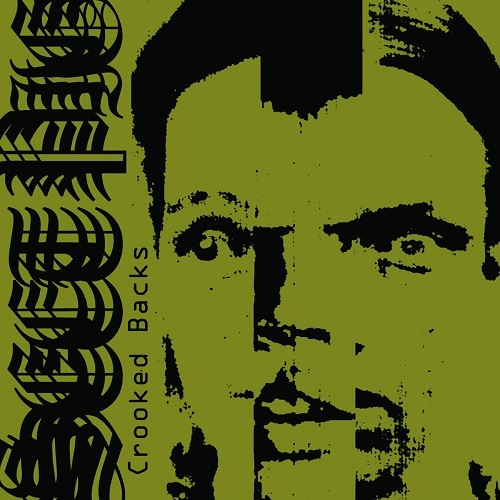 “Crooked Backs” is the most cohesive of the three Sect Pig albums, but it also draws together the band’s entire body of work and confirms patterns in the band’s approach, with each album clocking in at under 20 minutes and featuring similarly stylized two-tone artwork. Regular Version: Black vinyl MLP, jacket, insert. Die Hard Version: Mustard yellow vinyl MLP, jacket, insert, pin and sticker. 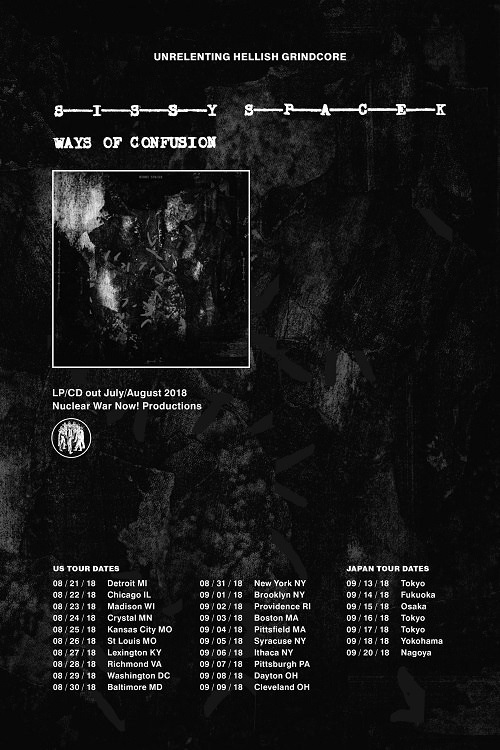 Ways of Confusion LP and CD are the press now. CD version is still available. Tape version will be back in stock in about a week. 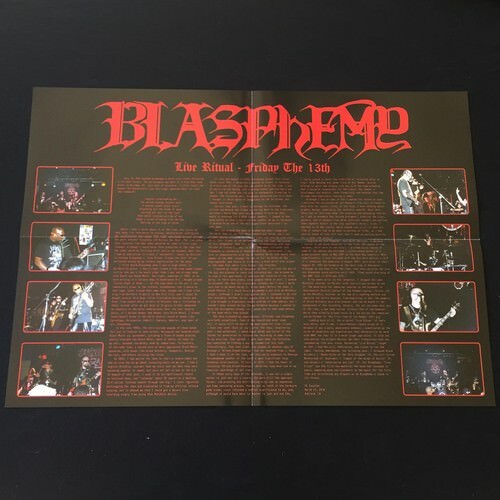 Throughout the label’s existence, Blasphemy has stood as a cornerstone in the foundation of Nuclear War Now! Productions. In fact, the band played a defining role in YK Insulter’s decision to make the label a serious endeavor, which has led to NWN’s productive output since its inception. 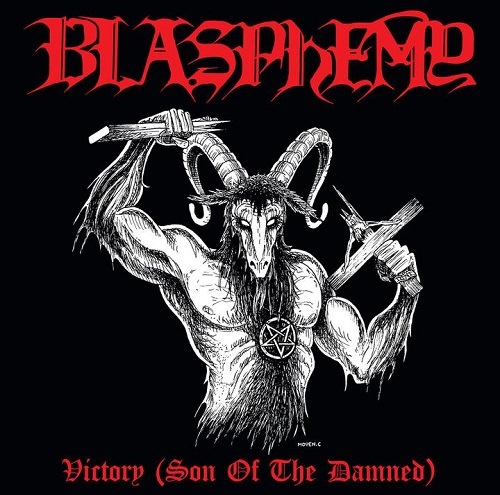 Specifically, it was YK’s pilgrimage to Blasphemy’s live gig on July 31st, 2001 that cemented the label’s future direction. 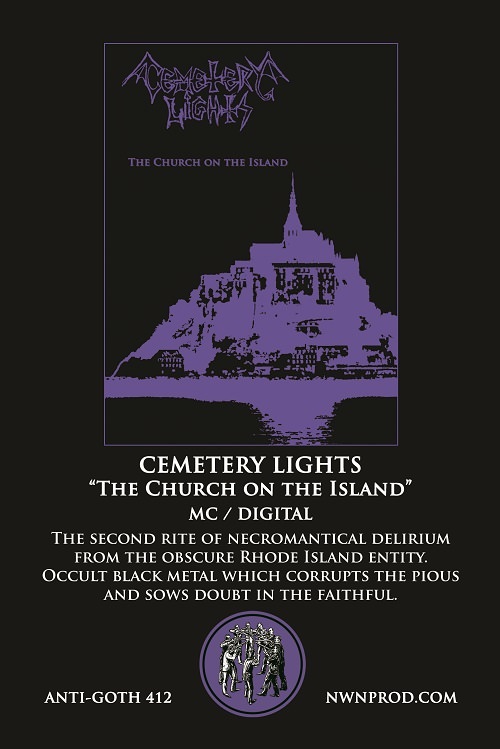 The impetus behind this voyage had actually occurred almost a decade earlier, sometime in 1993, when he was first exposed to the irreplicable brand of violent, bestial black metal epitomized by the band’s legendary “Fallen Angel of Doom….” album. 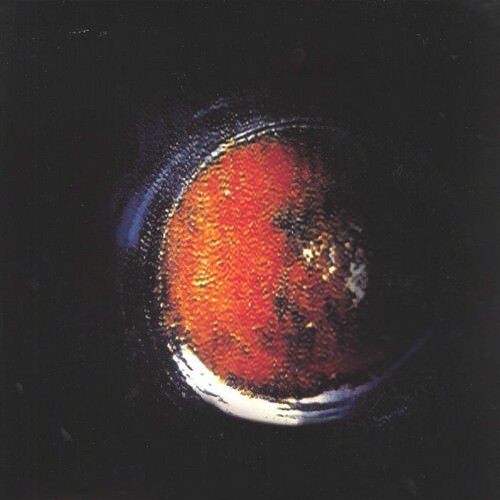 Hearing this recording on a car ride to a Carcass concert in Washington D.C. that year ignited YK’s ensuing reverence for the band and others of a similar ilk. 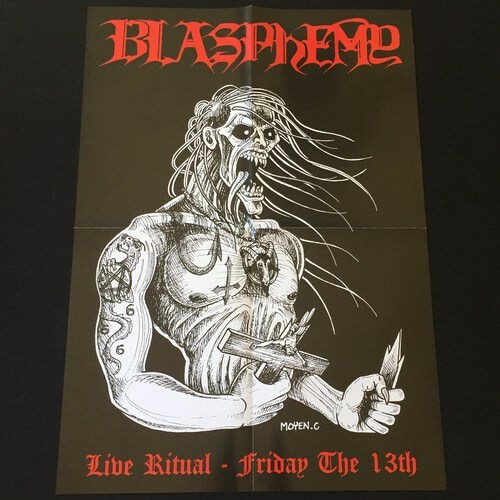 Six years later, when it was announced that Blasphemy would return to the stage in the summer of 2000 for the first time since 1994, life circumstances prevented YK from travelling to witness these atrocities. Nevertheless, when two additional shows were announced the following year, a high level of dedication combined with a dose of fortuitous luck resulted in his opportunity to attend and capture one of these shows on a digital MiniDisc recorder that had been gifted to him by an uncle. 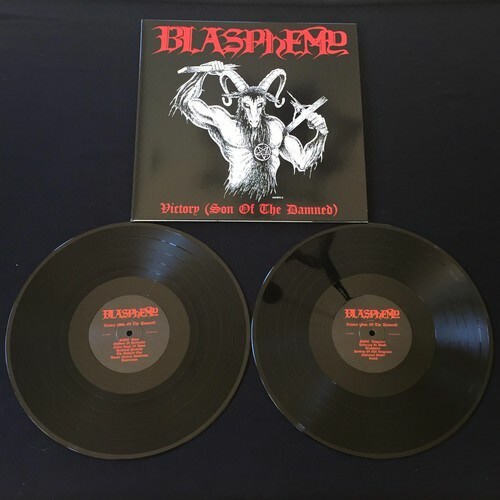 Although he had been given approval by Ryan Förster (aka DeathLord of Abomination & War Apocalypse) to record the event, it was not until after the gig that he obtained permission from Black Winds and Caller of the Storms to release the recording on LP format. 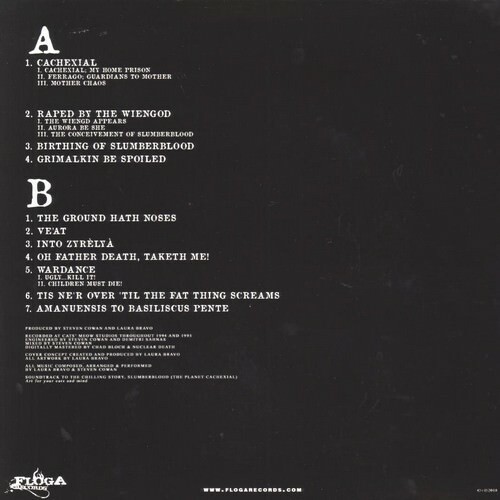 The consequent “Live Ritual – Friday the 13th” LP thus became the first vinyl LP in what has since become Nuclear War Now!’s extensive discography. 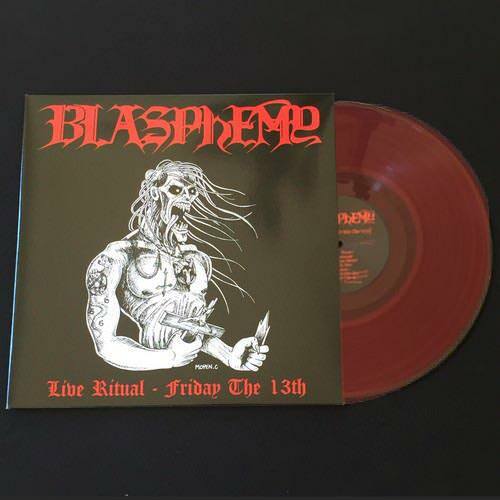 Originally a joint release with War Hammer Records, 666 copies of “Live Ritual” were pressed, with 100 on red vinyl, which would serve as the primary component in a more limited die-hard edition that also included, among other exclusive items, a CDR of a Blasphemy rehearsal that took place later that summer. Approximately seventeen years and several hundred other releases later, “Live Ritual” has become one of the rarest and most sought-after of all NWN releases, and so the time has come for a repress of this historic album. The audio has undergone an additional round of mastering at the hands of James Plotkin to remove the distracting preamble and improve the overall sound. The layout has also been updated to include a more extensive description of events that led to the recording as well as many photos from the gig. 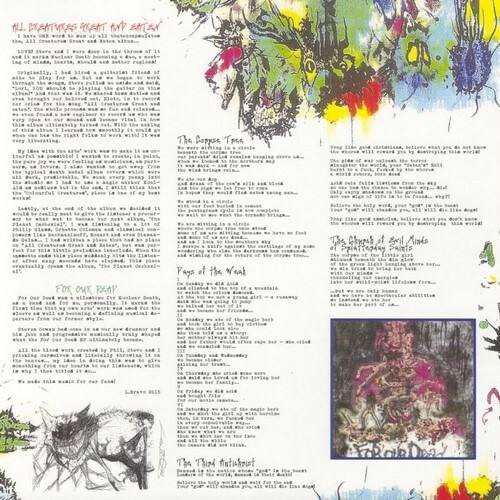 In addition to the regular and die-hard LP editions, it is also being made available on both CD and cassette in order to satisfy demand in all forms for this important document. While Nuclear War Now! 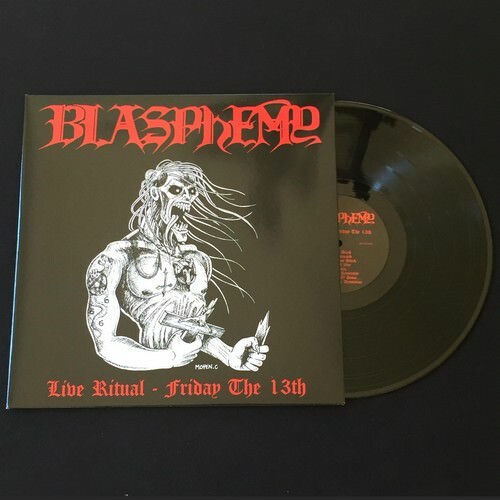 has continued to evolve from its humble beginnings to its current state, “Live Ritual – Friday the 13th” will always represent the enduring essence of the label, and therefore it is truly fitting that it once again see the dark of night. Die Hard Version: Red vinyl LP, gatefold jacket, 2 sided A2 poster, 36" cloth tapestry, sticker. Die Hard Version: Red vinyl DLP, gatefold jacket, A2 poster, 36" cloth tapestry, sticker. So what is at press now and when is coming Blood Upon the Soundspace LP? and any updates on Necrosleezer, new Sect Pig EP, Goatlord/Nunslaughter 4 way split, Ysengrin/Stargazer split LP and Necrosleezer demo repress? Necrosleezer layout is done. Just waiting to hear back from the band. Ysengrin/Stargazer recording is done. I need to follow up with the band about the layout. Sect Pig next MLP will be done by the end of the year I think. Blood Upon the Altar and Blood Upon the Soundspace MLPs are at the press now. Tape editions of these are also at the press now and will be out first. CD version will include both recordings. 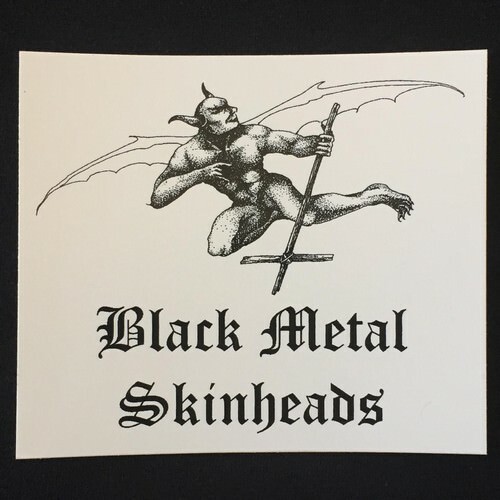 Black metal in the style of old Unisound bands. Demoncy new LP still in the works ? Yes the new album is still in the works. 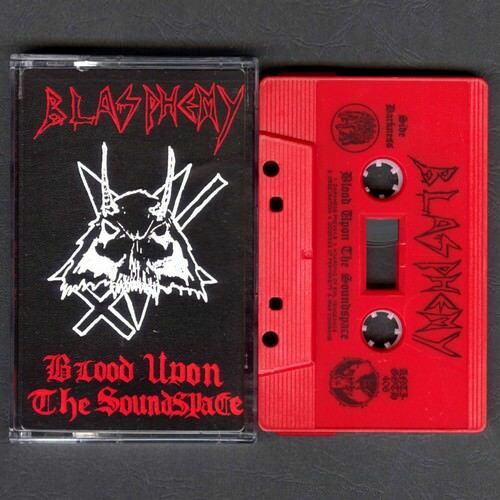 Although Blasphemy’s recorded output was limited, its endurance over the last three decades is a testament to its originality and extremity, and it all began with the Blood Upon the Altar demo. The band’s origin was unremarkable but auspicious. In 1984, founding members Nocturnal Grave Desecrater and Black Winds and 3 Black Hearts of Damnation and Impurity, who lived near one another and were already acquainted, began playing music together, mostly working on cover songs. They soon recruited Caller of the Storms and Black Priest of the 7 Satanic Blood Rituals to complete the original lineup. After briefly adopting the name Antichrist, the band eventually settled on the simple and iconic name Blasphemy and began writing songs. They refined their sound and focused their songs during live rituals over the next several years, although the lineup would fluctuate slightly when Black Winds did a brief stint in jail, and Bestial Savior of the Undead Legions briefly assumed bass duties. 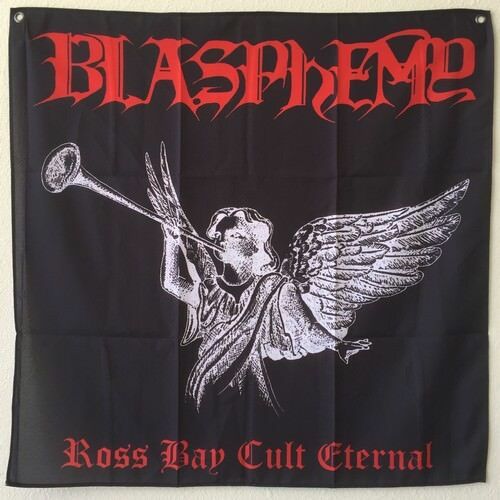 Black Winds soon rejoined the fold, and Blasphemy entered Fiasco Bros. studio in 1989 with an $800 budget. They emerged having produced one of the most devastating demo recordings ever made. 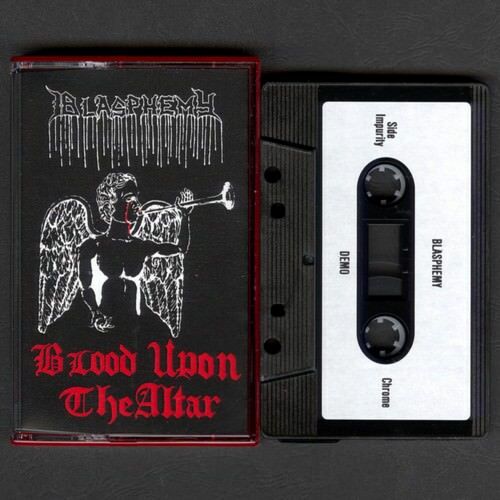 Blood Upon the Altar ushered in a new style of Black Metal, no less dark or evil than their contemporaries, but more confrontational, more violent. 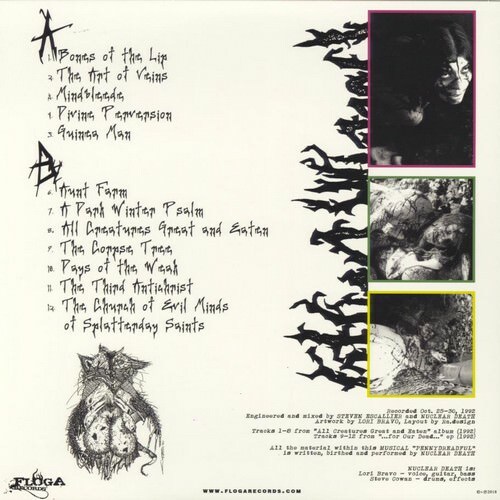 In addition to being heavily inspired by Bathory, Sodom, and Slayer, Blasphemy also drew from the punk infused Brazilian scene, especially SarcóI_LOVE_PENIS, as well as Grindcore bands like Blood and Genocide (Repulsion). 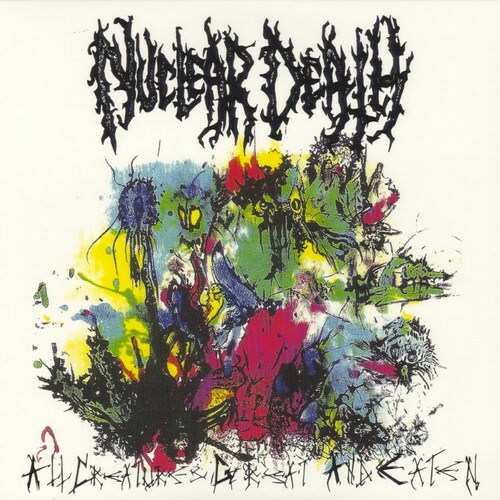 The resultant mixture of these influences yielded a demo that established a new standard for extremity in Black Metal, a bar that Blasphemy would continue to raise with each subsequent recording. This edition of Blood Upon the Altar marks the first time since its original release that it has been properly featured as a stand-alone album. 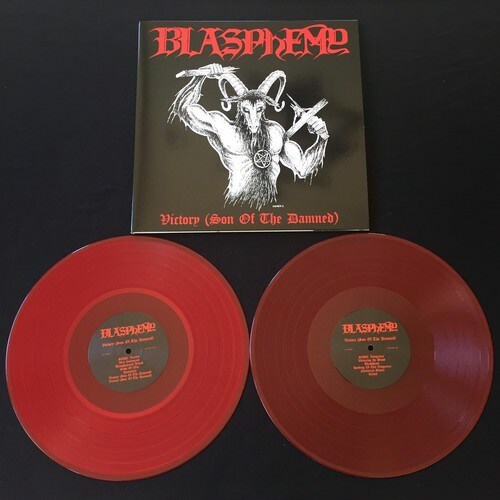 For far too long, this demo was tacked as bonus tracks onto the end of the Gods of War album, leaving the impression that Blood Upon the Altar was of lower stature; in fact, for many, Blood Upon the Altar is the most powerful Blasphemy release of all. Additionally, many of the earlier reissue editions of this recording had long gaps between the tracks owing to an improperly prepared digital master, but that flaw has been corrected with this version, which was also remastered by James Plotkin to ensure the best possible sound. 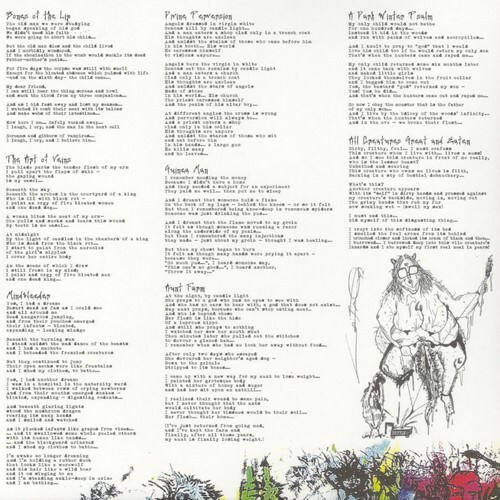 Finally, the original demo artwork once again adorns the cover of this LP, which also features a full-color gatefold. In every respect, this version—a joint release by NWN! 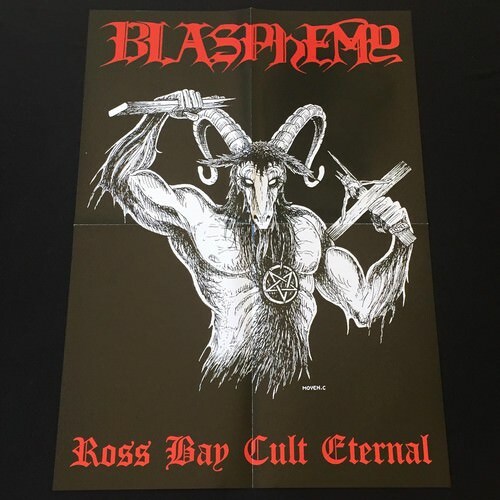 and Ross Bay Cult—seeks to restore Blood Upon the Altar to its original status as one of the most significant Black Metal recordings of all time. MLP version is scheduled to be released in September. CD version will include the “Blood Upon the Soundspace” tracks. 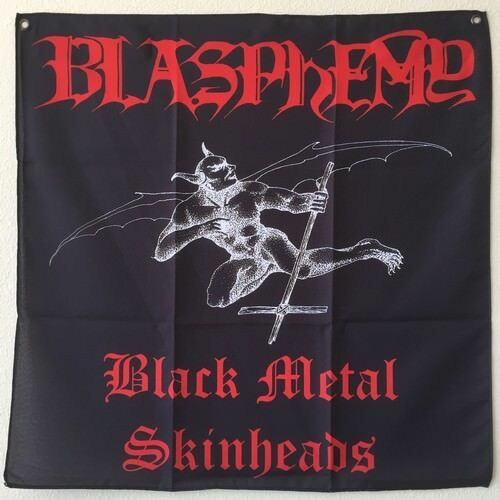 Black Metal Skinheads demon tapestry available exclusively with diehard?